There are 16 reviews of Anice. There are some perfumers, who remind me of Victor Frankenstein. "Look what I can do." Sometimes, they do not take the time to ask themselves, "Because I can, ought I to?" This is certainly a unique and original scent. Anise and fennel over a soft musk. The references to Sambuca and the classic Springerle Christmas cookie are right on the money. (Another scent I recently experienced reproduced garum masala perfectly). These gourmand scents are wonderfully right in the kitchen. They are part of the taste experience when eating the foods made with them. However, using them to scent the body can be jarring and confusing. This is well done, linear and certainly projects well. I must ask myself "Why would someone want to smell like a Christmas cookie or a popular liqueur? What will be the effect on others around me when I wear it?" I can't see this being worn in public. Around one's house however would seem perfectly fine, wearing for self, not others. If you love the scent of anise, fennel, licorice, etc. this is for you. Others just curious might do better sampling before blind buying. Pretty much what it says on the bottle. The opening is anise and salty black licorice, which cycle slowly toward a more herbaceous, bittersweet, yet still recognizably anisic accord in the heart. From there it’s pretty linear and uncomplicated, if not terribly potent or long-lasting. I’m not entirely sure what to make of this stuff. I think it does a better job than either Caron’s Eau de Réglisse or Hermès’s Brin de Réglisse, but I don’t find it all that wearable. In the end, it’s not merely a gourmand – it’s a food flavor. More of a curiosity than a perfume, if you ask me. I really like the opening of this; licorice candy...but the drydown and middle just turn into a very standard floral--pleasant, not offensive, but really special either. I would maybe give it 3.5 stars if I could. Together with Etra and some others, one of the Etro i appreciate less. As other reviewers underlined it is almost anise and nothing else, a sort of finally dry and straightforward anise-licorice-herbs accord with just a touch of musk. Another dominant anise fragrance is for instance l'Eau de Badian by L'Occitane which anyway surrounds the anise with some evident other decently dosed elements as grapefruit, blackcurrant, tea and moss. 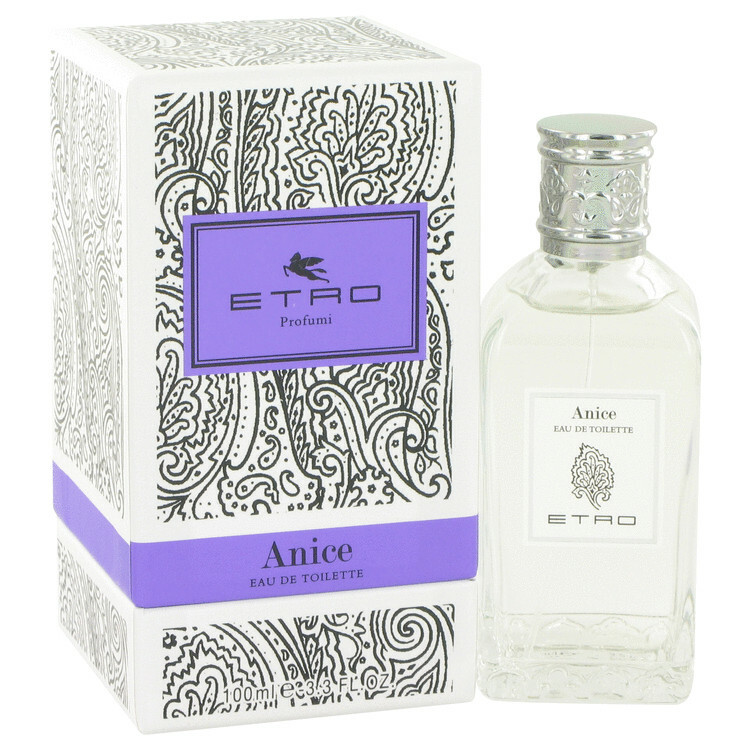 Anice Etro starts with a raucous, alcoholic (i see the association with Sambuca) and harsh blast of angelica, aromatic herbs, citrus and anise than evolves towards a sort of "solinote" dry smell a bit too cold, boozy and impersonal to be evalued as a fragrance. The smell is slightly windy (i mean airy and cold as well as some balsamic herbs or cumin are in the blend), exudes the metallic and (as others underlined) almost salty smell of licorice, may be owns some floral notes (rose?) in the blend together with cedarwood (rosewood?). Not for me although managed in its object. All I get from this composition is ANISE, ANISE and even more ANISE. A tremendously realistic interpretation of the ANISE. It inevitabily reminds me of an italian liqueur called Sambuca that is sweet, sticky and unmistakeably made from ANISE. The drydonw has some ANISE but it gets a little better with a shy dose of musk and vanilla, yet everything is still overwhelmed by the main ingredient: ANISE. Did I use the word ANISE too much? That's exaclty what this perfume does on the olfactory aspect. There are no member images of Anice yet. Why not be the first? Can you tell me a little something about Etro Anice?